The final week of SBS’ four-part documentary series Once Upon a Time in Punchbowl brings us to the last decade’s crises for Lebanese Muslim communities in Sydney’s west, and the path to redemption they have sought to follow. 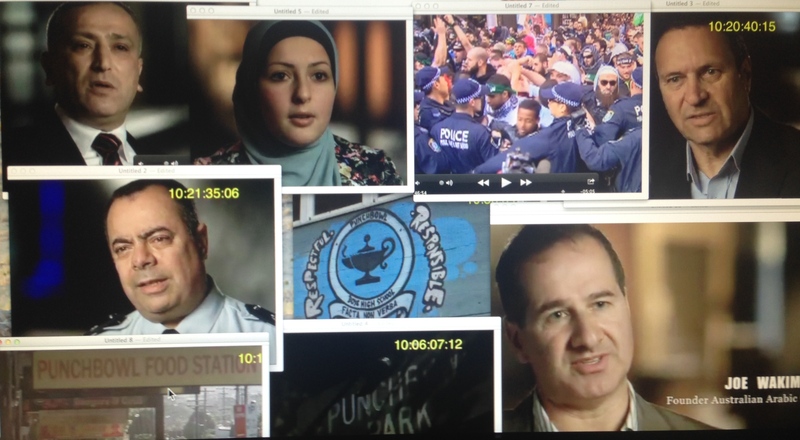 It is a story now that both unites and divides Sydney’s Lebanese communities. The Lebanese-background population in Australia remains majority Christian, with the simple Muslim/Christian differences complicated by sects and tensions within and between each of the main blocs: Maronite Catholics, Melkites and Eastern Orthodox, Shi’a, Sunni and Alawi, Druze, the political and the non-religious. Whatever the specific religious belief system they follow, there remains among them a shared cultural concern for respect, a currency that sustains the networks of families and clans. Sometimes that cultural economy of honour and shame can become toxic under the impact of fear, hatred, violence and crime. The Once Upon a Time in Punchbowl series starts from that point of tension to explore how the image of the Lebanese has become so corroded in Australia. The series has revealed that the Lebanese-Australian story today is an Australian story, forged from the interaction of people fleeing war, and finding a society unprepared for their arrival and the problems they carried with them. For a century, Syrian and Lebanese immigrants have travelled to Australia. Earlier generations battled White Australia to become a respected part of our diversity, ultimately providing long-standing and much-loved New South Wales governor Dame Marie Bashir. In comments I have received (and more than 130 on a previousConversation article exemplify these trends), there are four themes which find themselves at loggerheads. In a sense they reveal the backstory to the series, and the ongoing debate that Once Upon a Time in Punchbowl has entered. The most poignant moment for me came when I took a call from my local mechanic, a man I knew by his Australian first name. He had come to Australia as a 16-year old during the civil war in Lebanon after his Muslim family fled the violence. He had experienced racism throughout his life, changing his name to avoid the disdain his Arab name used to attract. He now runs a successful operation with his very Australian son. For him, the archetypal successful family small businessman, Once Upon a Time in Punchbowl had been the first time he had ever seen any recognition of his people and their lives in Australia outside the repetitive media stereotypes of inarticulate thugs into guns and gangs. [Your] one sided viewpoint (was) truly terrifying. I assert it is people like you that are responsible for the horrendous issues now facing Europe … Overly liberal do-gooders like yourself doing your best to ensure the islamisation of proud European nations populated by law abiding people enjoying their own impressive cultures. For this man, there could clearly never be a Muslim who was acceptable, no matter how moral, peaceful and productive. One of the other issues raised but in no way resolved by the series has been the Christian/Muslim divide. Filmmaker George Basha, one of the main characters in the series, is of Christian background, and his parents and the Muslim Lebanese parents in the series shared many experiences of difficult settlement, as their children did of racism. However, there is a growing apprehension among some Christian commentators that the series made three wrong moves. In private conversations it has been put to me that Once Upon a Time in Punchbowl suggested problems that they feel are essentially associated with Muslims but have been sheeted home to all Lebanese. It has also been said that this is the first real story of the Lebanese ever shown on Australian TV and should not have focused so much on the dark side of crime and violence when Lebanese have contributed so much to Australia’s development; and that the series resurrected “bad news” stories from the past that were best left undisturbed. The fourth type of response comes from people who were not part of these more intimate and impassioned engagements. The absence of stories of immigrant communities from most media unless they are a cause for fear, concern or momentary adulation (usually as sportspeople) has contributed to an extraordinary ignorance among Australians about our shared and complex histories. Similarly to the interest evoked in Vietnamese settlement by the Once Upon a Time in Cabramatta series in 2012, viewers have found that this series provided a very accessible history lesson, which integrated cultural awareness, personal narratives and social and political analysis. Viewers have appreciated the very non-stereotypical characters (discounting yours truly playing the sociologist) and understood the commonality of experiences and the reciprocated concerns expressed by Muslims and Christians about each other’s situations. Once Upon a Time in Punchbowl has a very clear central concern. It wants to take the headlines and look behind them; to take the stereotypes and humanise them; to take the issues and reveal their complexity. As with Once Upon a Time in Cabramatta, in this series we can see how culture and power meld, and how the powerless seek to find respect, and a fair place in society. The past few years in Punchbowl have seen the passing of two symbols of the old regime, both of whom who are carefully bypassed in the series despite the consequence of their actions. Sheik Hilaly, the former imam of the Lakemba mosque has retired, and his worst excesses have faded. Not far away, the political machine created by Christian politician Eddie Obeid is crumbling as the Labor Party he thought he once owned tries to recover. New players are now filling the void in politics, business, government, religion and crime. Perhaps now we might become more interested in and more aware of what that future holds. This entry was posted on July 8, 2014 at 1:17 pm and is filed under Uncategorized. You can follow any responses to this entry through the RSS 2.0 feed. You can leave a response, or trackback from your own site. Historically– very very few very few Christian Maronite Lebanese ever made it here big time–(practially no muslims)– no it wasnt until Fraser the Fabian progressivist gave the hordes of islamic Refugees outa Beirut centrals civil war breakout in 1975 a certain green light .I have known four only old Lebanese Christian famailies here for decades- and I most certainly know about the mixed character of Islamo Labanese and Palestinian refugees as a former law enforcement officer from Sydney-circa the 80’s. I also spoke at length from time to time with Lebanese muslim young men in Sydney who were upping stakes and moving to Brazil to embedd themselves with the Diaspora there which is over a century old– Brazil by the way has taken in thousands of refugees from Lebanon and more recently Syria ..